Trouble Waking Up? This Bed Will Toss You Out! | OhGizmo! Trouble Waking Up? This Bed Will Toss You Out! By David Ponce on 08/03/15 • Leave a comment! There’s two types of people in this world: those who wake up when their alarm rings, and those who snooze themselves into oblivion. 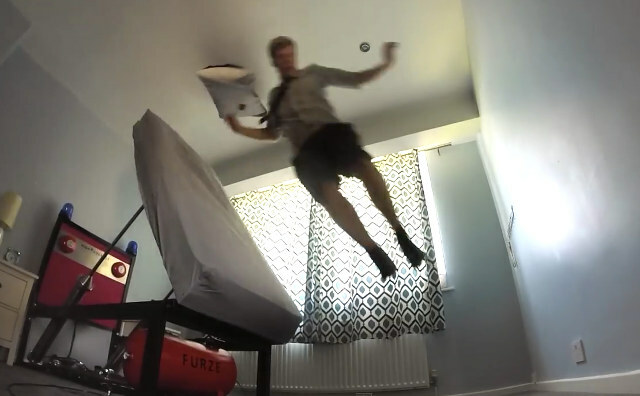 If you’re tired of letting your life pass you by because you can’t get yourself out of bed, you might want to consider Colin Furze’s approach: he built the Ejector Bed! When the time comes, it’ll activate two flashing lights, two fire alarms, a firework, two semi truck horns… and then launch you out of bed with a hydraulic lift. The pressure is adjustable, so you can either be gently tilted out, or violently expelled. Either way, you won’t be able to keep on snoozing and your day will lay before you, ready for consumption. Of course, the Ejector Bed is not something you can buy. But if Colin was able to build it, an enterprising reader could do the same.